Domafox here with my Holiday Special Offer for this month alone. 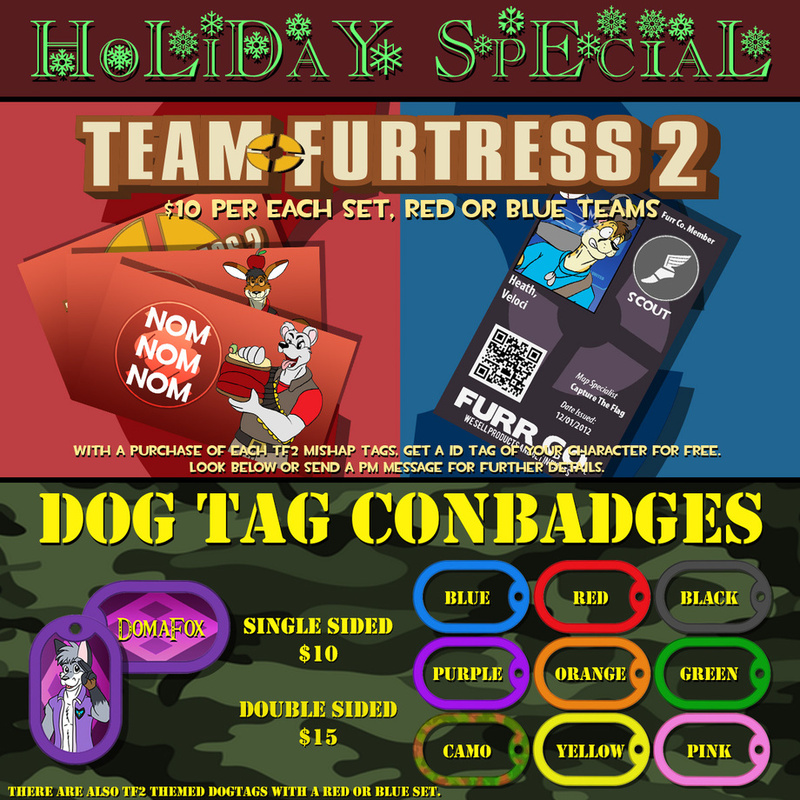 If you purchase any of my TF2 Mishap Tags, you will get an extra ID tag of your character's face, class, and stats on it including a QR code that links to your FA, IB, or other page you want them to go towards. I have 20 of these sets left, 10 for Red and 10 for Blue, each set is worth $10 along with the free ID tag. If you would like to own one, feel free to send me a message of what set you would like to own along with a character reference of your character and what other details you want for your ID tag in regards to TF2. If you would like to have one especially if you want to purchase before FC, feel free to send me a note and I will prepare it right away. will you offer these even AFTER the con an stuff? i dunno if this cons over or whatever yet but i can see myself getting some for my mate who is in the AF... once i can afford it..
yes I will offer them at any given time that best fits it for you.